DeWalt DWS709 vs DeWalt DWS780: Which One's Best? Stump Grinding vs Removal: Which Method To Choose? Belt Sander vs Orbital Sander – Which is Right for Your Needs? 15 Different Types of Planers & Their Uses – Which is Right for You? 12 Different Types of Axes & Their Uses – Which is Right for You? DeWalt DWS709 vs DeWalt DWS780: Which One’s Best? Your choice between DeWalt’s DWS709 and DWS780 is pretty straightforward, budget versus versatility. They deliver the same amount of power and weigh nearly the same. Home users have a choice of whether they want to pay more to do more things. If you just need a saw for simple, clean miter cuts, you can afford to keep some money in your pocket. If you think you’ll need something to do more or you’re a working professional, of course you’ll want to spend a little extra for superior delivery. Supposing you exist in that gray area between very occasional DIY user with simple needs and professional contractor whose livelihood demands more, we’ve broken down both models to their pros and cons for your further consideration. We invite you to read on so you can make a much smarter purchase. What’s the difference between them? Both have DeWalt’s 15-amp, 3,800 rpm motor, so they both deliver the same basic performance. It’s a good, powerful motor that if you use a nice sharp blade will cut through most wood like a warm knife through butter. Both delivered good long, deep precision right out of the box without the need for much upfront calibration. Although performance will always be everyone’s first question, in this case you can go right to the question of price versus versatility. If price is the driving consideration in your choice between these two, you’re going to buy the DWS709. It averages out to two-thirds the price tag of the DWS780. Considering that the DWS709 is a couple hundred bucks cheaper, that could be a pretty big incentive to forego the versatility that is the reason for the DWS780’s heftier price. In fact, since they use the same motor, we prefer to think of the DWS709 as the default saw, with your primary choice as whether you want to pay to upgrade it. For professionals or experienced DIYers who require precision, the general versatility of the DWS780 makes spending the money a pretty easy choice. It can deliver better bevel cuts at deeper angles. Pros will also like the laser, which is often just a pricey gadget but in the case of the DWS780 has real utility. Users who just want to make simple around-the-house things, have extra to spend on durability and basic precision will find the DWS709 everything they could want in a miter saw. The DWS709 is slightly larger and slightly heavier than the DWS780. It’s not enough to make a noticeable difference in lugging the thing around, but if your workshop or truck is especially cramped with every square foot valuable real estate, it might help you lean one way or the other. DeWalt has a reputation for good dependable, powerful tools. The DWS709 affirms that. it’s a great all-around saw, and durable enough to be job site portable. Dust collection for miter saws is always an issue, especially if you do a lot of work in confined spaces. But, this is going to deliver everyday performance and do it for years. Aside from modifications to the stand to permit greater angles of cuts, the DWS780 is basically the DWS709 with the precision XPS system added. What you’ll like about the DWS709 you’ll like about the DWS780, what you’ll dislike about the DWS780 if you just need the DWS709 is the price tag. The great thing about the Internet is that you have access to a wide range of user opinions. You don’t have to just take our word for it. We compared our experiences with these two saws with other people who used them. Here’s a quick rundown of what people had to say. In general, people are happy with these two saws viewed through the same general conclusions we reached. Neither excelled in power, which makes sense because they have the same motor. The DWS709 is a great all-around saw that delivers DeWalt quality at a DeWalt price. The DWS780 is a better saw, mostly because of the XPS precision guidance system, but if you don’t want that you can save yourself a nifty little pile of cash. Both saws are good, dependable and powerful. Other users find that the DWS780 also works angled cuts a little better, especially when paired with the XPS system. But, the DWS709 is still a great saw, and some users found the laser a bit distracting. In fact, the general consensus for users is that the DWS709 is probably enough saw for the average user, with the XPS something that would be attractive to people with specialty needs in a compound miter saw. A word of caution, however. DeWalt miter saws the last few years have had a reputation of coming with sometimes faulty fences. If you buy one, you will want to immediately check it to make sure that it’s straight and true. If it isn’t, address it promptly so that there’s no risk of a bad customer service experience. A lot of times, these choices are a matter of one product just being superior to the other. In this case, however, the two are from the same manufacturer and use the same motor, and both do an excellent job at miter and bevel cuts. So the question comes down to price and versatility. If you want something simple and straightforward, the DWS709 is a better choice because it’s less expensive. 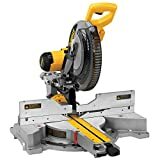 If your current and/or anticipated needs dictate that you need a miter saw with greater adaptability, you should spend the extra money for the DWS780. It gets no more complicated than that, and for people shopping for miter saws that’s probably a happy thing to hear. Hi there! My name is Adam and I write for HealthyHandyman. I have a great passion for writing about everything related to tools, home improvement, and DIY. In my spare time, I'm either fishing, playing the guitar, or spending quality time with my beloved wife. You'll also often find me in my workshop working on some new project! 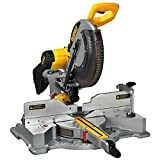 DeWalt DWS779 vs DWS780 Miter Saws: Which One’s Best? Kreg K4 vs Kreg K5: Which One’s Best? © Copyright 2019 HealthyHandyman. All rights reserved. healthyhandyman.com is a participant in the Amazon Services LLC Associates Program, an affiliate advertising program designed to provide a means for sites to earn advertising fees by advertising and linking to amazon.com.